MAP Training stands for Mental And Physical training. 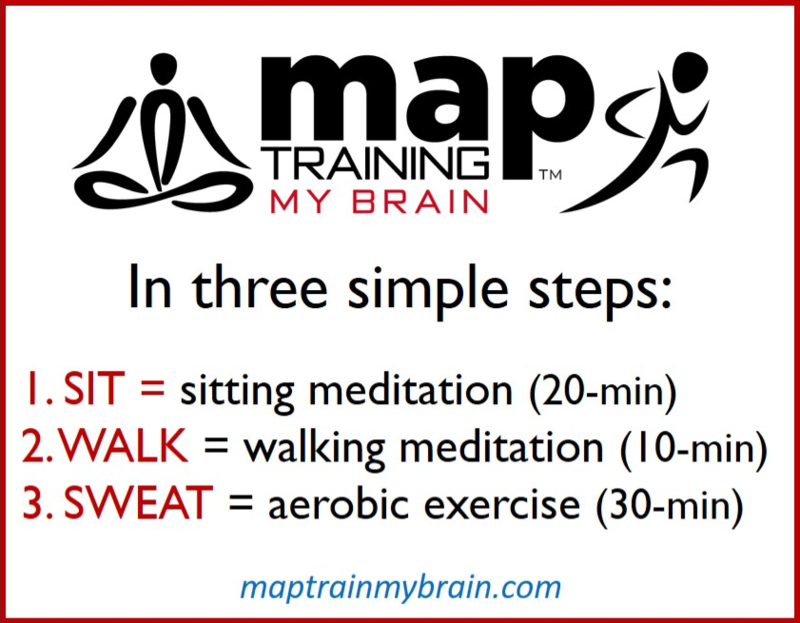 Each session of MAP training begins with twenty minutes of mental training with silent sitting meditation, followed by ten minutes of silent walking meditation. The session ends with thirty minutes of aerobic exercise at a moderate intensity. MAP training is typically provided at least twice a week for eight weeks with testing done before and after. MAP Training helps people with major depressive disorder (MDD). After 8 weeks of MAP training, participants were less depressed. Indeed, scores on Beck Depression Inventory (BDI) decreased by 40%. Depressive symptoms were even decreased in the “healthy” controls. MAP Training was also associated with increases in synchronized brain activity during cognitive control, a sign of healthy neuronal responses to challenging training conditions. The participants were also less likely to ruminate about the past, a tendency that often occurs during depression. Together, these data indicate that MAP Training enhances mental and physical health, especially for people suffering with depression. Sexual violence against women is a serious problem for society and recently there has been an awakening to the problem in modern society. Most of the emphasis has been on prevention and justice, but we must also consider the health and well-being of the survivors going forward: how can we help them learn to recover? Dr. Shors developed MAP Training specifically for this purpose and her team at Rutgers has been providing MAP Training to women who have experienced sexual violence. Afterwards, women report fewer trauma-related cognitions, less rumination and greater self-worth. MAP Training was provided to women in the community who were recently homeless, suffering untold trauma on the street and beforehand. They were also all mothers. Before training, levels of anxiety and depression were very high, and physical health was poor. After only eight weeks of MAP Training, twice a week, they reported fewer depressive symptoms and many fewer symptoms of anxiety. Their physical health vastly improved with a large increase in oxygen consumption.